Learn what you need keep in mind before to placing the ink cartridgs in the printers. Put an ink cartridge in a printer seems to be a simple process, but in reality must take several factors into account when placing an ink cartridge, if it is a new original cartridge or ink cartridge refilled or also compatible ink. The new ink cartridges and compatible both have a protective tape which prevents damage cartridges with the passage of time. We need to remove this tape, slowly is the main rule, when we remove this tape connectors may be damaged cartridge. If we put an ink cartridge refilling we have to verify that this is not clogged, verify that the cartridge connectors are not dirty, if so we will have to do a cleaning. Put an ink cartridge depends lot on the printer mechanism, depending on what our printer we have to know when to put the cartridge into the shuttle car, we really help the information provided by the printer manufacturer in the manual. 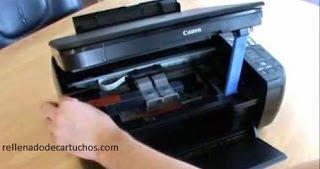 If you have printers using ink heads as they are, Epson, Brother even HP printers with heads, normal is a cartridge by cartridge installation and let the printer detects cartridges as we put the cartridges. We recommend using these printers with more frequency so that the heads are not covered. Do not touch connectors cartridge, this can cause immediate and irreparable mistake in the cartridges.